Wealthy moralist Ezra Pound will leave his fortune ($10 million!) to his cousin and family, if they are of sufficiently upstanding character in his eyes. But their daughter Barbara is in love with a producer and if there's one thing that Ezra dislikes, it is show business people. But this thin plot is merely an excuse to hang Busby Berkeley's fabulous musical numbers from. The movie itself is only so so, but the music and Busby Berkley dance sequences are superb. I am particularly smitten by the "I Only Have Eyes For You" dance and music number. 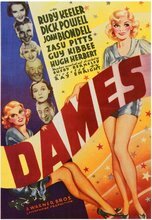 When Ruby Keeler appeared in the dance number after all the faces and almost winked at the camera, it made me a new fan. To think that all of this music was written for the movie also amazes me. Most of the music is still being used today. I would recommed the new disc set by Warner Brothers for viewing all the Berkley creations.